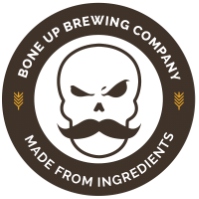 Stats: Warehouse - Bone Up Brewing Co.
Color: A warm flaxen buff, ringed by an almost radiant lightness. Food Pairing: Chicken nuggets (preferably as a Poor Man's Chicken Parm - topped with buffalo sauce and melted swiss). Music Pairing (Jimbo's Choice): "Front Porch Trained" by Reverend Peyton's Big Damn Band. Music Pairing (Jared's Choice): "Jugular Vein" by Mr. Lif or "Uptight (Everything's Alright)" by Stevie Wonder. Brewer's Notes: We like a bone-dry saison as much as anybody, but this time around we figured we'd boost the body on this mamma jamma (all the more feels for your mouth) with a fistful of oats 'n rye. Other than that, we went for a fairly straightforward interpretation of the style so we could really let the distinctive character of our house yeast shine through.